An interesting Premier ballpoint with black acrylic barrel and Sterling Silver Ciselle cap. Made in France, the cap carries French hallmarks. Perfect mechanism. Made 1980's. Parker Duofold Centennial Presidential Mk II model in black and pearl. In near mint condition with presentation box, outer and papers. Made 2001 and fitted with an 18 carat gold fine nib. A superb AF set made in England circa 1950. Fountain pen fitted with a 14 carat gold medium nib. Pencil in perfect order. Both are in near mint condition and come with original box. A perfect 51 Aeromatic Custom with black cap button in Dove Grey. Made circa1955. Fitted with a fine Octanium nib. An Aeromatic in Burgundy manufactured circa 1954. Fitted with a 14 carat gold fine nib. A near mint model in green marble and fitted with an 18 carat gold medium nib. Original box supplied. Circa 1988. A near mint model in black and fitted with an 18 carat gold medium nib. Original box supplied. Circa 1988. A very good early 1990's model with an 18 carat gold medium nib but, let down by a poor repair to the cap top which we have rectified as best possible. The cap was dropped and apparently, separated at the clip rim. A reasonable but not very pretty attempt to glue it back up using epoxy resin by its previous owner. There is no cap split and the cap is still serviceable and will last. UK Duofolds are much under-rated pens. In truth, they are superb in terms of nib quality and serviceability in that their parts, actually last. This one is a Junior edition made circa 1960 and fitted with a 14 carat gold medium nib. It is in Mint condition. A reasonably good first edition 45 model for its age fitted with a steel medium nib. Circa late 1950's. Original converter fitted. A very good 45 fitted with a 14 carat gold medium nib. 1960's. Original converter fitted. A Mint condition Duofold Junior fitted with a 14 carat gold medium nib. Circa late 1950's. Still carries original chalk marks to barrel. An Australian made Ciselle in Sterling Silver from the 1970's fittedwith an 18 carat gold fine nib. In perfect order. A superb American made Sterling Sliver set of fountain pen and ballpoint in the first edition style. Fountain pen fitted with an 18 carat gold fine nib. A Duofold full size in near mint condition fitted with a 14 carat gold medium nib. A 1950's pen. A very good Sonnet made 1990's but with wear marks to the barrel end. Fitted with a fine nib. A full size Duofold in excellent condition manufactured in the 1950's. Fitted with a 14 carat gold medium nib. An excellent Sonnet in matt black manufactured in the 1990''s and fitted with a fine nib. A double jewel black model manufactuted 1933 and fitted with a superb 14 carat gold fat stub nib of around 1.8 mm width. A superb writer. A great example in golden brown pearl manufacturted in 1934. Fitted with a 14 carat gold medium nib. In Emerald Pearl and made in Canada circa 1934. Fitted with a 14 carat gold Extra Fine nib. Barrel and cap colours match perfectly but, for one reason or another, the cap is (correctly) fitted with a matching striped jewel, whereas the barrel blind cap is fitted with a black jewel. The pen has one fault - the ink feed is missing three fins from one side of the feed. The lack of three fins does not appear to affect the performance of the pen which writes well. A superb Mk I Duofold in stunning Blue Marble. Original converter fitted. Fitted with a 14 carat gold Fine nib. Manufactured circa 1988. An excellent 75 Ciselle in Vermeil. Virtually unmarked. Fitted with a 14 carat gold Medium nib. Manufactured circa 1966. A nicely kept pen in near perfect condition with converter. Fitted with a 14 carat gold Medium nib. Manufactured circa 1968. Converter fill 61 in Dove Grey. Converter supplied. The gold filled cap of the pen is showing signs of age. Fitted with a 14 carat gold Extra Fine nib. Manufactured circa 1966. Mk II version. In superb condition in pearl and black. With original converter and box. Fitted with a 14 carat gold Medium nib. Manufactured circa 1996. MK I fountain pen and pencil set in orange. Absolutely perfect condition with original converter, box, outer and papers. Fitted with a 14 carat gold Fine nib. Manufactured circa 1990. An excellent Sub Deb Vac in Azzure Blue Pearl. Fitted with a 14 carat gold Fine nib. Manufactured circa 1941. The darkest side of the barrel appears in the image. Blue Diamond model in Silver Pearl and fitted with a Fine nib. Manufactured circa 1941. Manufactured circa 1941 in Gold Pearl and fitted with a 14 carat gold Fine nib. A superb Major in Silver Pearl manufactured circa 1942 and fitted with a 14 carat gold Medium nib and with Blue Diamond. A very well kept Parker 65 with Gold filled cap. Fitted with a 14 carat gold Medium nib. Manufactured 1970's. Faultless condition and fitted with original converter. A superb 75 in Vermeil fitted with a 14 carat gold Fine nib. Manufactured circa 1966. An unusual and uncommon P11 multi-colour ballpoint and pencil. Contains red and black ballpoint refills and a 0.5 mm pencil. Refills need replacement. A nice Parker 45 set comprising fountain pen and pencil. The fountain pen is fitted with a 14 carat gold Medium nib. The converter in the fountain pen has been re-sacced. Pencil is mechanically perfect. Both in excellent order. Circa 1964. A clean and good 51 Aero with no cap dents to its Lustraloy cap. Fitted with 14 carat gold Medium nib. Circa 1950's. Cap jewel is faded. English Parker 51 Vacumatic. Circa early 1950's in Cordovan Brown. Fitted with very smooth 14 carat gold Parker Medium nib. Brassed arrow on clip. A 1980's Falcon set of fountain pen and ballpoint. Fountain pen has very light scratches on cap base. Ballpoint has a hairline crack in the clip ring which has been professionally repaired. FP fitted with 14 carat gold Parker Medium nib. A very impressive set with unfortunate discolouration to fountain pen barrel. Fountain pen fitted with 14 carat gold Parker Medium nib and carries mild brassing to cap clip. Made circa 1930. Pencil is unmarked. With original box. An unmarked 51 Aeromatic with black cap button. Faultless cap, barrel and shell. Fitted with octanium Parker Medium nib. English 51 Aeromatic. Fitted with 14 carat gold Parker Fine nib. No scratches or cap dings. Aeromatic in very good order. Perfect barrel and shell. No cap dings or dents. Fitted with 14 carat gold Parker Medium nib. A very good 1934 Vac in Grey and Black Marble. Fitted with 14 carat gold Parker LH Oblique nib. Slight barrel discolouration and a query over the originality of the barrel trim ring. A very nicely kept Sterling Silver Ciselle. Entirely original but, we have replaced the cap clutch with a new version as the original lacked a little tightness. Fitted with 14 carat gold Parker Medium nib. Made circa 1928 in Green Jade. Obvious fading to barrel. Otherwise, good plating and markings. Fitted with 14 carat gold Parker Medium nib. Circa 1928 in Green Jade. Light brassing to bands and cap clip. Engraved name in barrel which has obvious fading. Fitted with Extra Fine Parker 14 carat gold nib. Made circa 1929 in Green Jade. Fitted with a Medium 14 carat gold Duofold nib which shows signs of having been straightened at one point in its life. Some brassing to cap clip and lower cap band. Barrel shows obvious signs of discolouration. Made circa 1920. An early single band model. Fitted with a Fine 14 carat gold Parker nib. Slight brassing to cap clip ball. Very good colour and no fading. In excellent overall condition. Made circa 1923 in black lined. Lucky curve feed intact. Fitted with Fine 14 carat gold Parker lucky curve nib. Minimal brassing to cap clip ball and small portion of cap ring. Made circa 1930. Fitted with Extra Fine 14 carat gold Parker nib. Brassing to cap clip ball and cap band, otherwise in excellent condition. Made circa 1930 in burgundy marble. Fitted with Parker Duofold 14 carat Medium nib. In faultless condition. Made circa 1929 in burgundy marble. Slight brassing to cap clip and cap rings. Made in Canada. Fitted with 14 carat gold Parker Duofold Canadian Medium nib. Made circa 1929 in burgundy marble. Slight brassing to cap clip and cap rings. Made in Canada. Fitted with 14 carat gold Parker Duofold Canadian Fine nib. Made in red and black marble circa 1940's. Brassing to cap clip ball and minor brassing to two of three cap rings. Fitted with 14 carat gold Parker Medium nib. Fountain pen in burgundy with an ever so slight chip to the shell above the nib. Matching parker 51 pencil. Fountain pen carries 14 carat gold Parker Fine nib. Circa 1960's. Made circa 1937 in red and black marble. Ink view window in excellent condition. Fitted with 14 carat gold Parker Fine nib. Made circa 1939 in green and black marble. Ink view window in excellent condition. Fitted with 14 carat Parker Medium Stub nib. Made circa 1940's in green acrylic. Perfect plating to clip and cap rings. Fitted with Parker 14 carat gold Medium nib. Manufactured circa 1939 in black acrylic. Fitted with 14 carat gold Parker Extra Fine nib. Darker ink view window than most. Brassing to cap clip and band. Lever filler- a most unusual feature for a Parker. Manufactured circa 1935. Fitted with 14 carat gold Parker Medium nib. With ink view window. Minor brassing to cap clip and lever. Parco model manufactured circa 1936. Fitted with 14 carat gold Parker 'Parco' Medium nib. Some brassing to cap clip and cap bands. An unusual lever filler model. Pink, silver and black striated model. Manufactured circa 1941. With ink view window. Fitted with Parker 14 carat gold Extra Fine nib. Brassing to cap clip and cap band. In black and pearl. Manufactured circa 1930. Evident fading to barrel. Fitted with Parker 14 carat gold Medium nib which has had a crack re-soldered. In black and pearl. Manufactured circa 1930. Evident fading to barrel. Fitted with Parker 14 carat gold Fine Nib. Circa 1926. Manufactured in permanite. Insignificant brassing to cap ball and small portion of cap band. Fitted with Parker 14 carat gold Duofold Fine nib. Manufactured in permanite, circa 1930. Minor brassing to cap ball and cap ring. Fitted 14 carat cold Parker Duofold Fine nib. Circa 1935 in multifacetted green marble. Minor brassing to cap clip, cap rings and lever. Fitted with Parkette steel Fine nib. 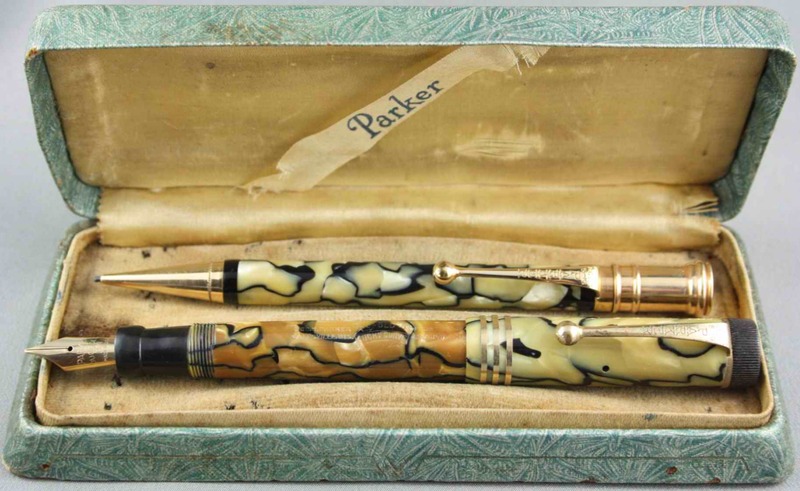 A very unusual lever pen made by Parker and is a must for any serious Parker collector. In light pastel apple green. Manufactured circa 1927. Some discolouration of barrel. Brassing to cap clip and bottom cap ring. A very uncommon and collectable pen. Fitted with Parker 14 carat gold Fine nib. Manufactured 1940's in navy blue. Brassing to bottom cap ring. Fitted with 14 carat gold Parker Fine nib. In green and black swirl. Recent manufacture. Fitted with Parker Medium gold nib. Supplied with original converter. Recent manufacture in dark green. Fitted with Parker gold Fine nib. Supplied with Parker converter. Recent manufacture. Supplied with original converter. Fitted with Parker Fine gold nib. An English Duofold made in navy blue in the 1960's. In excellent order, fitted with Parker Duofold 14 carat gold Medium nib. Made in the United Kingdom circa 1950's. Fitted with Medium 14 carat gold Parker nib. 12 carat gold filled Parker 51 Ballpoint. United Kingdom made mid-sized Duofold. Manufactured circa 1950's. Fitted with 14 carat gold Parker Fine nib. Manufactured in the United Kingdom circa 1960's. Fitted with 14 carat gold Parker Fine nib. In superb condition. Manufactured circa 1990's in matte black. With original converter, fitted with Fine stainless steel nib. Manufactured circa 1950's in the United Kingdom. Double jewel button fill mechanism. Fitted with 14 carat gold Parker Fine nib. Slight brassing to cap clip and band. United Kingdom made Parker 51. Made circa 1960's. Fitted with 14 carat gold Parker Fine nib. Very clean cap with no dents. Manufactured in the United Kindom circa 1950's. Fitted with Parker 14 carat gold Fine nib. Its only vices are brassing to cap clip and band. Manufactured United Kingdom circa 1950s in unusal dark brown. Button filler mechanism. Fitted with Parker 14 carat gold Fine nib. Insignificant brassing to cap clip and band. Manufactured in the United Kingdom circa 1960's. Button filler mechanism. Fitted with Parker 14 carat gold Fine Stub nib. Features unusual but original cap clip screw. Very good plating. An excellent version in black laque. Made by Parker in France between 2000 and 2002, this was not Parker's most popular model. So unpopular was it that Parker withdrew it from production after just two years. Ellipses are now highly sought after by collectors. This pen is in superb condition and is fitted with an 18 carat gold medium nib. In Brown Laque and both pieces in superb near mint condition. Made in France circa 1980's. Fountain pen fitted with Medium 18 carat gold Parker nib. A very original 45 with Lustraloy cap from the mid 1970's in near mint condition. Fine to medium 14 carat gold Parker nib. Made in Canada circa 1937 and fitted with a monstrous 14 carat gold Parker Fine to Medium nib. Good colour to most of cap and some evident but not heavy barrel staining. A classic from the 1950's. Made in England and fitted with a 14 carat gold Parker Medium nib. Made by Parker in France between 2000 and 2002, this was not Parker's most popular model. So unpopular was it that Parker withdrew it from production after just two years. Ellipses are now highly sought after by collectors. This pen is in excellent order and is fitted with an 18 carat gold two-tone nib. In excellent condition and fitted with a Medium Octanium nib. In Blue Cedar with Vacumatic filler and fitted with 18 carat gold Medium nib. Minor dents in rolled gold cap. Canadian double jewel model made circa 1930. Fitted with 14 carat gold two-tone Fine nib. Unusual model fitted with metal non-lockdown filler button and long blind cap. Brassing to cap ring. Mint, unused Mark III Parker 51 in Olive fitted with a 14 carat gold Fine nib and a 12 carat rolled gold cap. An earlier model Mk III circa 1969 with a pearl cap jewel. Original label attached. Mint, unused Parker 51 Mark III in Dark Blue fitted with a Fine 14 carat gold nib and Lustraloy cap. A later model Mk III circa 1970 -1972 and fitted with an integral chrome cap button. Original label attached. Mint, unused Parker 51 Mark III in Black fitted with a Fine 14 carat gold nib and Lustraloy cap. A later model Mk III circa 1970 - 1972 and fitted with an integral chrome cap button. Original label attached. Mint, unused Place Vendome in Rolled Gold and fitted with a 14 carat gold nib. Original label attached. A rare find. Mint unused 75 circa 1970 fitted with Medium 14 carat gold nib. Mint, unused T1 (Titanium) ballpoint. Circa 1970 with original label. Carries the "red jewel" typical of T1's. An English Duofold circa 1870 in Mint, unused condition. In Black with a Fine nib. Original label attached. 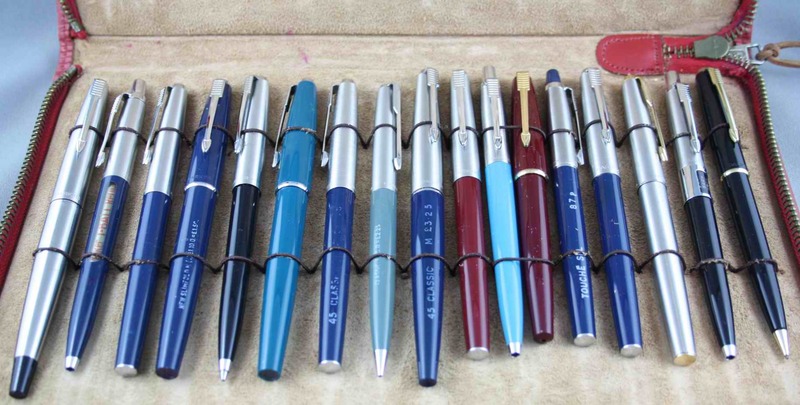 45 fountain pen manufactured 1970's with a Medium nib and in Mint, unused condition. Original label attached. 45 fountain pen in Red manufactured 1970's with a Medium nib and in Mint, unused condition. Original label attached. Mint, unused Matt Brown Falcon manufactured circa 1980 fitted with a Medium nib. Original label attached. Mint, unused Black Falcon manufactured circa 1980 fitted with a Medium nib. Condition A near Mint 180 in navy laque finish manufactured circa 1979. Fitted with a Medium nib. A Black ribbed 35 fitted with a Medium nib. Mint, unused. Manufactured 1980's. Original label attached. A Brown ribbed 35 fitted with a Fine nib. Mint, unused. Manufactured 1980's. An excellent Parker 75 fitted with a Medium nib. Circa 1970's. Circa 1979 in very good condition and fitted with a Fine nib. Mint, unused rolled gold Parker 75 fitted with a Fine nib. Manufactured 1980's. Mint, unused 180 fitted with a Fine nib. Manufactured circa 1979. A near perfect Duofold which has been lightly used, In superb near Mint condition. Fitted with a Medium nib and manufactured circa 1988. An English aeromatic filler. Circa 1960's and fitted with a Fine nib. An very good Vac in Teal fitted with a Fine nib and rolled gold cap. Late 1950's. Minor cap dings. Very good Vac in Black fitted with broad nib and near perfect rolled gold cap. Circa 1950's. Minor barrel scratches. A very clean and original Sonnet manufactured 1990's and fitted with converter and medium Parker stainless steel nib. An English 51 Aeromatic with a Parker 14 carat gold fine nib and rolled gold cap. A good Mark III 51 Aero with rolled gold cap and fitted with a Parker 14 carat gold medium nib. Minor scuffing to barrel and shell. A Sterling Silver 75 Ciselle manufactured 1964. Carries an engraved name and three minor dents to the top of the barrel. Fitted with Parker 14 carat gold medium nib. An attracive Duofold, full size in burgundy with aluminium cap button. Slight brassing to cap band. A very good 1950's pen with 14 carat gold Parker medium nib. Circa 1945. A sound Televisor with 14 carat gold Parker medium nib. Some brassing to cap rings and cap clip. A sound 61 fitted with converter. 14 carat gold Parker fine nib. A UK made gold filled Vector which has seen little use. Fitted with original converter and 14 carat gold Parker medium nib. A very well kept Duofold AF. Circa 1948 and featuring a 14 carat gold Parker very fine nib. Aerometric in Midnight Blue with extra fine Octanium nib. Barrel has residue of engraved name. Aerometric with 12 carat gold filled extra fine Octanium nib. Minor cap dent. Possibly incorrect cap jewel fitted. Engraved initials in barrel. An excellent English fountain pen and pencil set in Dove Grey. Both carry the intials "GGS" in gold fill in the barrel. Aerometric filler pen features a 14 carat gold medium nib. Blood Red 21 with Octanium fine nib. Name engraved in barrel. Dove Grey Aerometric. Fitted with 14 carat gold medium nib and 12 carat gold filled cap. Six small (pin prick) dents in rear of cap. Parker Lady Duofold. Circa 1936. Fitted with 14 carat gold Parker Medium nib. Excellent overall condition and markings. In excellent condition. Engraved signature on barrel. Circa 1934. Fitted with 14 carat gold Parker Medium nib. Parker Vac Slender double jewel. Circa 1934. Fitted with 14 carat gold Parker Medium nib. Aerometric Filler. Circa 1940, made in England. Fitted with 14 carat gold Parker Medium nib. Slightest mark to lustraloy cap from clip. Minor scratch to shell top. These are all Parker 61s without gold arrows on the shell. There is nothing uglier than a 61 which has lost its arrow and the arrow indent remains. Hence, on these pens, the arrow indent has been removed by us and the shell re-finished. There is nothing wrong at all with these 61s save for the lack of the gold arrow on the shell. Some have typical shell shrinkage. They have been cleaned and serviced and where fitted fitted with capillary fillers, these have been cleaned to the point of removing the filler and re-assembly. All fitted with 14 carat gold Parker nibs as marked. Capillary filler. Fitted with 14 carat gold Parker Medium nib. Dove Grey with rolled gold cap. Capillary filler. Fitted with 14 carat gold Parker Fine nib. Red Classic with rolled gold cap with very minor dents. Name engraved in barrel. Capillary filler. Fitted with 14 carat gold Parker Fine nib. Black with rolled gold cap with 5 mm diam. shallow dent in rear of cap. Scratched teflon coating to caplillary filler. Evience of gold arrow having been re-glued to shell. Capillary filler. Nickel plated arrow. Fitted with 14 carat gold Parker Fine nib. Dove grey in faultless condition. Capillary filler. Nickel plated arrow. Fitted with 14 carat gold Parker Medium nib. Aerometric filler. Fitted with 14 carat gold Parker fine nib. Dove Grey with rolled gold cap. Faultless condition. Parker 51 Aerometric filler with 12 carat rolled gold cap. Parker 14 carat gold medium nib. Very minor ding to cap . Barrel engraved with the name "J P Busby". Blue Diamond Junior Vac, Canadian made circa 1941 fitted with 14 carat gold Parker fine nib. Nickel trim. Black Aeromatic with Lustraloy cap. Fitted with 14 carat gold Parker medium nib. Minor "loose clip scratches" to cap. In excellent condition and has seen little use. Fitted with Parker medium nib. Description 17 Parker fountain pens, ball points, rollerballs and pencils all in Mint condition. Many feature original manufacturer's chalk marks. Includes two Parker 45 and two (modern design) Parker Slimfold fountain pens and a demonstrator Parker Jotter. Housed in a handsome red leather case. Price $850 AUD + GST or, a sensible offer. Description Aeromatic 51 in black with medium gold nib. Shell tip has been shaved. Carries a small (4 mm long) cap lip crack. Description Aeromatic 51 with gold medium nib. Shell tip has been shaved. Description A very good Aeromatic 51 with medium gold nib. Slight plating wear to cap clip. Description An English Aero 51 with Lustraloy and gold plated cap clip. Mild scuffing to cap clip. Fitted with a medium gold nib. 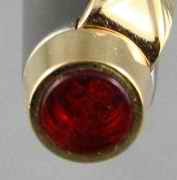 Description An English Duofold in burgundy fitted with a 14 carat gold medium nib. Description A handsome Slimfold in black fitted with a 14 carat gold fine nib. Description English Slimfold fitted a 14 carat gold medium (to broad) nib. Description An English Victory fitted with a 14 carat gold Parker medium nib. Some loss of barrel thread which does not impede proper cap fitting. The name "H.A. Bliss" is engraved on the barrel. Description Canadian button fill Premiere fitted with a 14 carat gold Parker medium nib. Excellent plating and very good overall condition. Circa 1932. Description Good Victory in Black. Made circa 1948. Fitted with English Parker 14 carat gold medium nib ground to RH foot. The nib is a re-tip which has been expertly ground. Good plating. Light surface scratching to barrel and cap. Minor fading to hard rubber section. Description Burgundy barrel and gold plated cap. A pen which has seen a "good writing experience" and features a few dings in the cap. Barrel is in good condition. Fitted with Parker 14 carat gold medium nib. Description An excellent Junior Duofold in Black with good "Lucky Curve" markings. Predictably, the Lucky Curve feed is not intact. Made in Canada circa 1928. Fitted with a medium "Duofold" Canadian nib. Description A nice Parker Aero with a 14 carat gold Parker medium nib. No dents to cap. Light scratching to barrel. Description A good capillary filler 61 with (brand new) Turquoise shell. Fitted with Parker 14 carat gold fine (to medium) nib. Description An excellent Valentine (made by Parker in England) circa 1943. The original Valentine nib was provided to us but alas, had lost tipping on one tyne. A replacement 14 carat gold Parker English medium nib has been fitted. Description Cordovan Brown Aero circa 1952. Fitted with Parker 14 carat gold medium nib. Minor marks to shell and short split at base of aluminium cap. Description Gold plated 61 with Turquoise shell. Fitted with Parker 14 carat gold broad nib. Description Gold plated Parker 75 fitted with Parker 14 carat gold medium nib. Description Black laque Parker 75 fitted with 14 carat gold Parker fine nib. Minor scratches to cap which do not penetrate laque finish. Description Brown Duofold AF manufactured circa 1946. Fitted with a (US) 14 carat gold Parker rhodium plated fine nib. Description Vacumatic Major in black. Circa 1941. Fitted with 14 carat gold Parker (Arrow) fine nib. Minor barrel staining. Description Striated brown double jewel vac manufactured circa 1939. Fitted with 14 carat gold Parker (Arrow) fine nib. Description Grey/Black double jewel vac manuafactured circa 1934. Fitted with 14 carat gold Parker (Arrow) nib. Evident barrel staining. Nickel plated clip and gold bands. Description UK Slimmfold manufactured circa 1962. Fitted with 14 carat gold Parker 14 carat gold broad nib. Description A very well preserved Challenger manufactured circa 1939. Fitted with a 14 carat gold Parker medium (UK) nib. Description English Duofold Junior manufactured circa 1948 in Green. Fitted with 14 carat gold Parker medium nib. Description A black UK Duofold AF made circa 1948. Fitted with 14 carat gold Parker fine nib. Light scratches over barrel and cap. Description A mint Parker Super 17 made circa 1964 still featuring original chalk marks. Fitted with 14 carat gold Parker nib and original Pressac filler which is perfect. Description A very original Slimfold in black fitted with a Parker 14 carat gold No 5 medium nib. Description A very good 51 Vac . Fitted with 14 carat gold Parker medium nib. Circa 1946 in Burgundy with Lustraloy cap. Description An interesting Duofold Junior with rare incisions on cap and barrel. These were occasionally found in the model and there appears no explanation to their presence. Ostensibly, these are a Parker variant on the Juniuor Duofold model. Fitted ith a medioum Parker 14 carat gold nib. Traditional variation in colour between cap and barrel. Description English Parker Junior Duofold fitted with a 14 carat gold Parker medium nib. Description A very good English Victory button filler with a very fine Parker 14 carat gold nib. Minor scuf marks to barrel. Description English Slimfold fitted with a medium Parker 14 carat gold "5" nib. Lightly scratched to barrel and cap. Description Press button Duofold made in England circa 1954. Fitted with 14 carat gold Parker medium "N" nib. Minor ubiquitous toothmarks to blind cap. Description Senior Duofold made in England circa 1954. Fitted with 14 carat gold Parker medium "35" nib. Aerometric filling mechanism. Description Teal Blue "Slimfold" version made in England circa 1948. Fitted with 14 carat gold Parker medium "10" nib. Aerometric filling mechanism. Description An excellent Parker Duofold Centennial fountain pen featuring burgundy marble and flat bands with engraved clip feathers. Original Parker Arrow medium gold nib. Ballpoint matches the fountain pen but has a (repaired) crack in the finger grip. Plating and fittings on both are excellent. The set is English made and dates to 1987. Description English made, circa 1952. In excellent condition and fitted with Parker medium 14 carat gold nib. Description An English Model 17 with covered point. Made circa 1964 Fitted with a medium Parker 14 carat gold nib. Description An English Duofold circa 1953. Fitted with Parker Duofold "N" fine 14 carat gold nib. Description An English Slimfold in perfect condition. Circa 1962. Fitted with medium 14 carat gold Parker nib. Description Mid-brown new style (NS) English Duofold button filler. In very good condition and fitted with a Parker ("N") 14 carat gold medium nib. Circa 1946 with gold plated ring at end of blind barrel cap. Description English Parker Slimfold in Blue featuring 14 carat Parker medium nib. Overall in excellent condition. Excellent plating and good markings. Description Circa 1927 - a near perfect Parker Senior Duofold in Blue Lapis. Featuring a American 14 carat Duofold "N" (fine) nib. Lucky Curve feed has been removed. Good embossing on both barrel and cap black fittings. Excellent imprint and in remarkably good condition with moderate brassing only to cap band. The name "J. Rogers" is lightly engraved in the barrel. The pen comes with what we believe to be the original box marked in ink "Xmas 1928". Description Made in Toronto, Canada circa 1929. In good condition save for brassing to ring and small cap split which has been repaired. Average markings. Excellent, original 14 carat gold Duofold nib with "N" mark. Description Circa 1964. An English Lady Duofold in very good condition. Nib has been replaced with 14 ct gold medium which is not a Parker original. Writes well. Good plating with no brassing and light scratches only to cap and barrel resin.